I’m trying to incorporate more brown rice into my life. When I picked up a box of minute brown rice, I noticed some of the recipes on the back of the box. Normally I don’t bother reading them but the word curry caught my eye, and boy do I love me some curry. I’m not afraid to admit that I made a recipe from the back of a box. And it was delicious. I added chicken at the end to make this side dish a main dish. Drain pineapple chunks, reserving juice. Add chicken broth (about 2/3 cup) to equal 1 cup liquid. Set aside. Heat oil in medium pan over medium heat. Sauté curry powder and garlic 1 to 2 minutes or until garlic is lightly browned. Add reserved pineapple juice mixture, pineapple chunks, and brown sugar; bring to boil. Stir in rice. Reduce heat to medium. Cover and simmer 5 minutes. Remove from heat and let stand 5 minutes or until liquid is absorbed. Fluff with fork. Looks delish, doesn’t it?! It was. 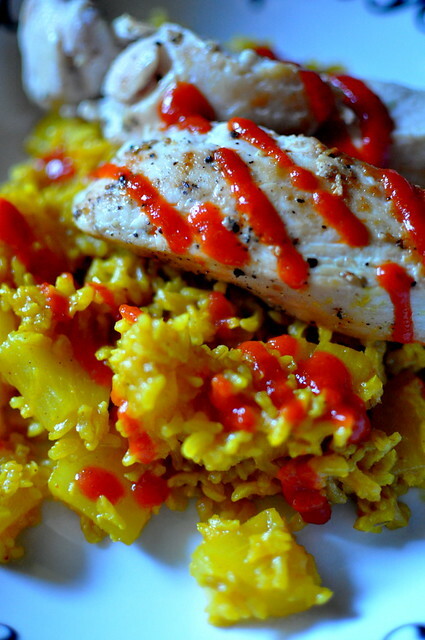 And with all things curry (and really anything else I eat), I topped it off with some Sriracha Sauce. Mmmm. 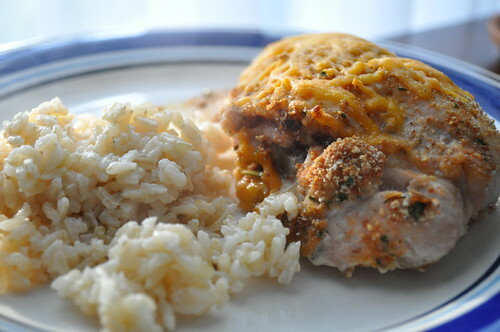 i stumbled across this blog, Skinny Taste, and i put chicken thighs in the recipe search box. this recipe came up and i figured i’d give i a whirl. everything else on the site looks amazing so why not try it? while my photo doesn’t compare to the one on the site, i will say it was quite yummy. 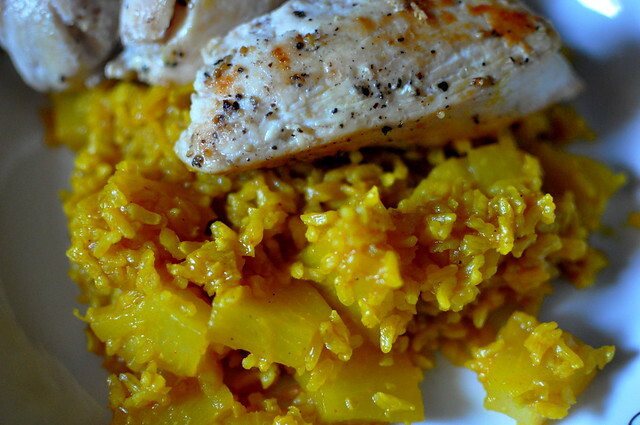 i served it up with a side of brown rice and presto – easy week night meal with no regrets. thank you, Skinny Taste! marinade chicken in artichoke hearts and juice for at least 20 minutes. discard the liquid and add garlic, parsley, salt and pepper. broil for about 10 minutes on each side, or until golden brown on each side, about six inches from the flame. 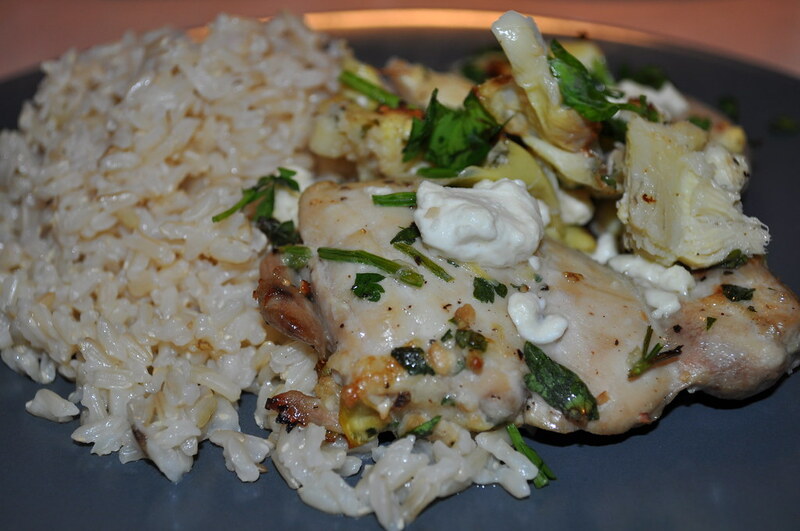 top chicken with feta and broil for a few more minutes and then top with more parsley.